FREE EVENT - NO TICKETS OR PURCHASE NECESSARY! Deb Perelman, award-winning blogger and New York Times best-selling author of The Smitten Kitchen Cookbook, understands that a happy discovery in the kitchen has the ability to completely change the course of your day. Whether we're cooking for ourselves, for a date night in, for a Sunday supper with friends, or for family on a busy weeknight, we all want recipes that are unfussy to make with triumphant results. Deb thinks that cooking should be an escape from drudgery. Smitten Kitchen Every Day: Triumphant and Unfussy New Favorites presents more than one hundred impossible-to-resist recipes--almost all of them brand-new, plus a few favorites from her website--that will make you want to stop what you're doing right now and cook. These are real recipes for real people--people with busy lives who don't want to sacrifice flavor or quality to eat meals they're really excited about. You'll want to put these recipes in your Forever Files: Sticky Toffee Waffles (sticky toffee pudding you can eat for breakfast), Everything Drop Biscuits with Cream Cheese, and Magical Two-Ingredient Oat Brittle (a happy accident). There's a (hopelessly, unapologetically inauthentic) Kale Caesar with Broken Eggs and Crushed Croutons, a Mango Apple Ceviche with Sunflower Seeds, and a Grandma-Style Chicken Noodle Soup that fixes everything. You can make Leek, Feta, and Greens Spiral Pie, crunchy Brussels and Three Cheese Pasta Bake that tastes better with brussels sprouts than without, Beefsteak Skirt Steak Salad, and Bacony Baked Pintos with the Works (as in, giant bowls of beans that you can dip into like nachos). And, of course, no meal is complete without cake (and cookies and pies and puddings): Chocolate Peanut Butter Icebox Cake (the icebox cake to end all icebox cakes), Pretzel Linzers with Salted Caramel, Strawberry Cloud Cookies, Bake Sale Winning-est Gooey Oat Bars, as well as the ultimate Party Cake Builder--four one-bowl cakes for all occasions with mix-and-match frostings (bonus: less time spent doing dishes means everybody wins). Written with Deb's trademark humor and gorgeously illustrated with her own photographs, Smitten Kitchen Every Day is filled with what are sure to be your new favorite things to cook. 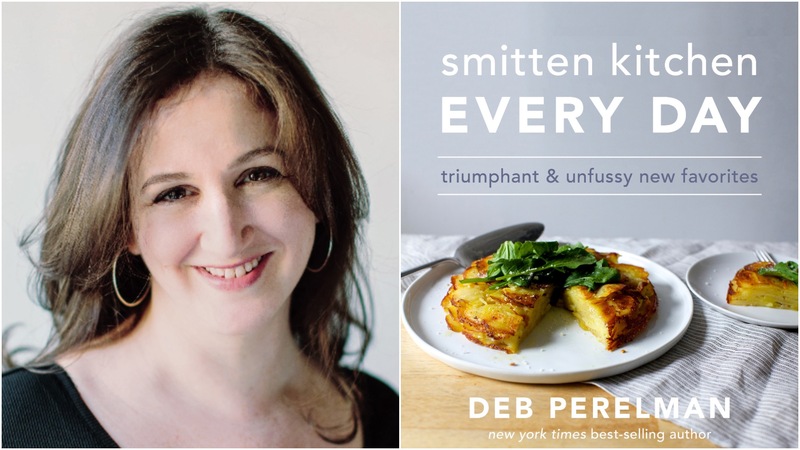 DEB PERELMAN is a self-taught home cook, photographer, and the creator of smittenkitchen.com. She is the author of the New York Times best-selling The Smitten Kitchen Cookbook, which won the IACP Julia Child Award. Deb lives in New York City with her husband, son, and daughter. OOOH, CHECK OUT THE DELICIOUS BOOK TRAILER!